Editor's note: See also the related analysis article, "Measuring the iPad's Potential for Education," here. As anticipated, Apple formally unveiled its new $499 mobile device, the iPad, Wednesday, heralding the company's entry into the space currently dominated by netbooks and its first serious move into the category of electronic book readers. Described by Apple CEO Steve Jobs himself as a "magical and revolutionary product," the WiFi- and 3G-enabled iPad is designed for mobility and for handling tasks like browsing the Web, viewing multimedia, playing games, and reading books in electronic format (via a new app called iBooks). And it's designed to do it more effectively than smart phones and laptops, as well as the current generation of netbooks and tablets, which Jobs described as clunky--slow, with low-quality displays, and, of course, running a non-Apple operating system and software designed for personal computers rather than mobile devices. As many had speculated leading up to the formal unveiling, the new iPad is a tablet-like device, sporting the look and feel of an iPhone or iPod touch, but on a larger scale. Unlike the iPod touch, it supports 3G networking in some models; and unlike the iPhone, it does not require any sort of contract with a particular vendor. iPad 3G-enabled models use new GSM micro SIMs and are unlocked. 3G plans start at $14.99 for up to 250 MB and go up to $29.99 for unlimited data. They include free use of AT&T WiFi hotspots and can be canceled or activated at any time via the iPad itself. 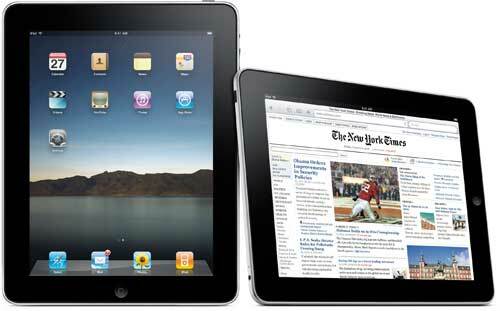 The iPad is the first device that will use an Apple-designed chip, the Apple A4, which runs at a clock speed of 1 GHz. The unit is 0.5 inches thick and weighs in at 1.5 pounds, according to specifications released by Apple today. The screen measures 9.7 inches diagonally and was described by Apple as "full capacitive multi-touch." Storage, which will be flash-based, will range from 16 GB to 64 GB. Up to 10-hour battery life. The software, like the hardware, resembles that found on the Apple iPhone. In fact, it's compatible out of the box with all iPhone and iPod apps, of which there are currently more than 140,000. It's also capable of viewing electronic books that have been released for the iPhone, of which there are also thousands. In addition to its iPhone/iPod-like user interface--ditching the common desktop UI metaphors in favor of simple application buttons--it also sports a pop-up onscreen QWERTY keyboard, support for full-screen HD video via YouTube, and common tools like calendar and maps, as well as some newly designed apps and an e-book reader. 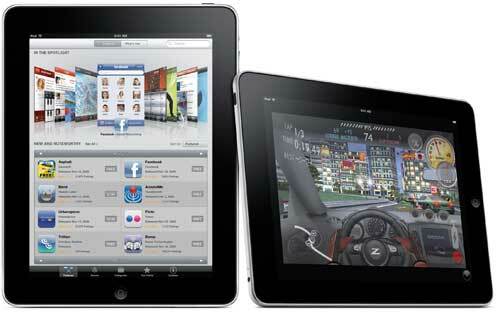 Developers will also be able to design apps specifically for the iPad to take better advantage of the display. (An SDK is being released today as well.) Apple said it has already rewritten all of its iPhone apps to take advantage of the new device's features. Several showed off their newly redesigned apps during the iPad launch event today in San Francisco. Apple also launched an iPad version of its iWork office and productivity suite, which includes apps for presentations, word processing, and spreadsheet. Each is compatible with its Mac OS X counterpart and will sell for $9.99. But the big news for K-12 education and colleges and universities is the debut of the iBooks app, as well as the partnerships Apple has engaged in with book publishers, including Macmillan, Simon & Schuster, Penguin Group, HarperCollins Publishers, and Hachette Book Group. iBooks is sort of like an iTunes for books, functioning as both a reader (using the ePub format) and a book store. $829: 64 GB storage and WiFi with 3G. An iPad USB Power Adapter. Apple said WiFi models will ship in 60 days. 3G models will begin shipping in 90 days.